Henry (d.1155) archdeacon of Huntingdon's 'History of the English', is important more for the fact that his work was much copied in the Middle Ages, than for its own originality. For the earlier part he relied heavily on Bede, and even for the period of his own lifetime he does not tell us much of great historical interest. A thirteenth-century inscription records that it then belonged to the Augustinian Priory at Southwick, near Fareham and Havant, in Hampshire. This manuscript is part of a collection formed by the Howard family, Dukes of Norfolk, who lived at Arundel Castle, north of Littlehampton in West Sussex. 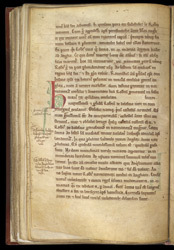 Halfway down the text on this page, just after the red initial 'H', is a reference to Arundel Castle (castellu[m] Arundel), and in the left margin this has been highlighted by one of the Howards, by the note 'Arundell castellum'.